A Bitcoin (hard)fork is simply just a copy of the existing Bitcoin code with some additional tweaks. The entire histories of the two versions are identical up until the block in which the developers decide the fork will occur. After that, the copy begins recording transactions on its own, separate blockchain using the new forked currency. 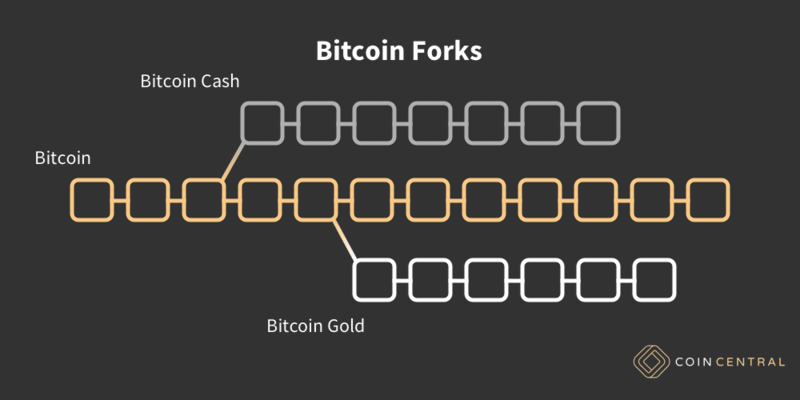 Some popular Bitcoin forks include, but are definitely not limited to, Bitcoin Gold and Bitcoin Cash. During a fork, the developers take a snapshot of the blockchain ledger at the forked block. For every Bitcoin that you own at that time, you receive a certain amount of the new Bitcoin fork currency. This is usually a 1:1 ratio. Although not as valuable as Bitcoin, these forked coins usually have some monetary value and are effectively free money if you choose to claim them. Claiming forked coins does take some work, though. Depending on how you normally store your Bitcoin, some claims may be harder than others. In this guide, we’ll go over a few different ways to get coins from Bitcoin forks and what you should be careful of during the process. Before making any attempt to claim a Bitcoin fork, you should first take some time to research the forked coin. Developers seem to be constantly forking Bitcoin, and many of the coins are worth nothing after the fork. It may not be worth your time and effort to claim a coin with little to no value. The most important thing you need to check in your research is whether or not the forked coin has replay protection. Replay protection ensures that the network can differentiate the new coin from old. Without this, it’s possible to accidentally send coins on one fork when making a transaction on the other – a transaction replay. Avoid forked coins without replay protection at all costs. Each Bitcoin fork is different, and with that, the list of fork supporting platforms is also different. To ensure that you are eligible to claim the forked coin, you need to have your Bitcoin in a wallet or on an exchange that supports the fork when the block snapshot occurs. The recommended place to have your Bitcoin during a fork is in a Bitcoin wallet in which you control the private keys. Complete control of your private key puts the process entirely in your hands. Most exchanges will announce whether or not they’ll support upcoming Bitcoin forks. If you do keep your funds on an exchange (not recommended), be aware of their announcements and protocol on forks. If the information isn’t readily available, you should reach out to customer service or move your Bitcoin to a wallet temporarily for the fork. If you’re lucky enough to store your Bitcoin in a wallet or exchange that supports the forked coin, the process is simple. Just wait. Once the forked chain goes live, the platform will credit your account with the new coin. Some wallets may provide additional instructions on what you need to do to claim your “free coins”. If you hold your Bitcoin in a wallet that doesn’t support the new coin, the process is a little more complex. When the forked chain is live and stable, find a wallet that supports it. Set-up the new wallet for yourself, and import a copy of your Bitcoin private and public keys from your other wallet. With your keys imported, the new coins should be available in your wallet. Once again, there may be additional steps provided by the wallet that you need to take to claim your coins. At this point, the coins are fully in your control, so the choice is yours – sell or hodl. If you believe the coin has value and is going to continue going up in price, keep on holding. If you think that the fork was just another cash-grab by developers and probably won’t exist in 6 months, go ahead and sell it away. Either way, these Bitcoin forks are a good opportunity to make a little extra cash while supporting the original crypto-king. For a complete list of upcoming Bitcoin forks, check out our guide here.